Kareo is the only cloud-based, clinical and business management platform designed specifically for the unique needs and built to enable the success of Ophthalmology providers. The platform can be accessed with a single module purchase or through a combination of modules to create a customized solution tailored to the needs of your practice. Improve your workflow and revenue with a fully integrated Modernizing Medicine EMA and Kareo Practice Management solution. 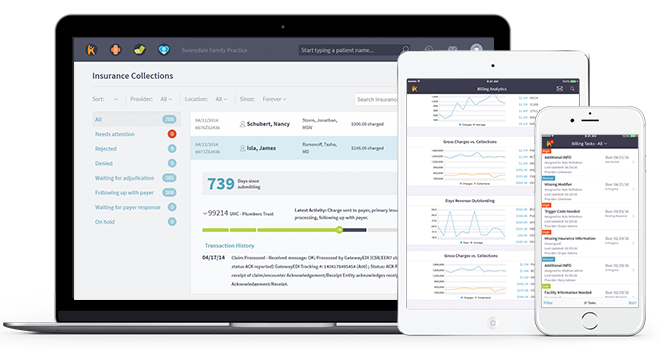 Kareo’s Open Practice Management (PM) and Modernizing Medicine's Electronic Medical Assistant's® (EMA™) integration gives you an affordable and easy to use medical office software platform designed for your specialty. Spend less time worrying about billing. Let Kareo billing experts handle things, so you can focus on your patients. Lifestyle Eye Center is continuing to grow and expand because of streamlined billing operations and steady cash flow thanks to Kareo. "Personally, I love Kareo because it is very user friendly, has good reports system, and the clearinghouse is a part of the system. From a billing perspective it is very easy to track the claim status ..."
"We started Kareo 3 years ago and it completely turned my life around. Easy to learn software, friendly and knowledgeable staff, and reasonable pricing. I just love it. We travel in an RV and I have ..."
"I started my own practice from scratch 2 years ago. As a solo practitioner, I had to keep costs contained yet be efficient at the same time. Kareo allowed me to do both. I looked at various EMRs and ..."
"Kareo has been great to work with. The interface is intuitive and easy to learn. There are many reports available that are very helpful. Kareo support has been very responsive and good to work with. ..."
"New staff get up to speed very quickly. I am training a person to work in Kareo and do eligibility and authorizations, and she learned how to do her job in a couple of"